It has the border, padding and scrolling. The full set of features. There are no margins, as they are not the part of the element itself, and there are no special properties for them. You can open the document in the sandbox. The picture above demonstrates the most complex case when the element has a scrollbar. Some browsers (not all) reserve the space for it by taking it from the content. 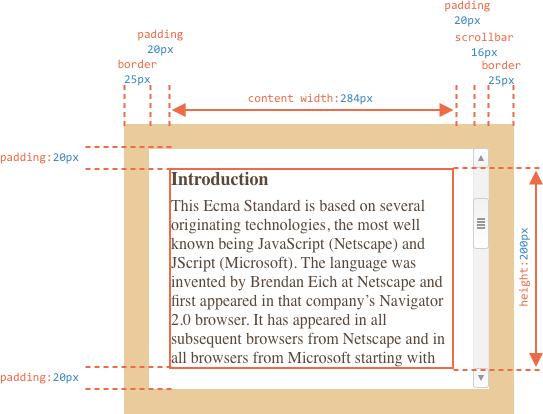 So, without scrollbar the content width would be 300px, but if the scrollbar is 16px wide (the width may vary between devices and browsers) then only 300 - 16 = 284px remains, and we should take it into account. That’s why examples from this chapter assume that there’s a scrollbar. If there’s no scrollbar, then things are just a bit simpler. 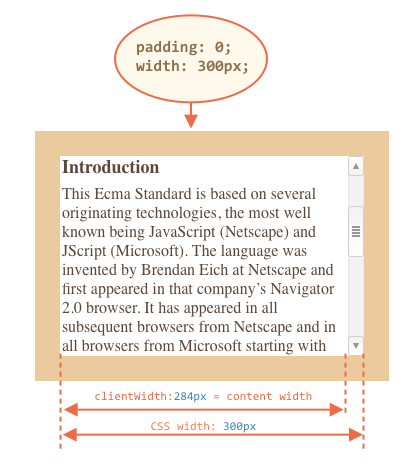 Usually paddings are shown empty on illustrations, but if there’s a lot of text in the element and it overflows, then browsers show the “overflowing” text at padding-bottom, so you can see that in examples. But the padding is still there, unless specified otherwise. Element properties that provide width, height and other geometry are always numbers. They are assumed to be in pixels. They are many properties, it’s difficult to fit them all in the single picture, but their values are simple and easy to understand. Let’s start exploring them from the outside of the element. These properties are rarely needed, but still they are the “most outer” geometry properties, so we’ll start with them. In most practical cases we can use offsetParent to get the nearest CSS-positioned ancestor. And offsetLeft/offsetTop provide x/y coordinates relative to its upper-left corner. For not shown elements (display:none or not in the document). Now let’s move on to the element itself. These two properties are the simplest ones. They provide the “outer” width/height of the element. Or, in other words, its full size including borders. 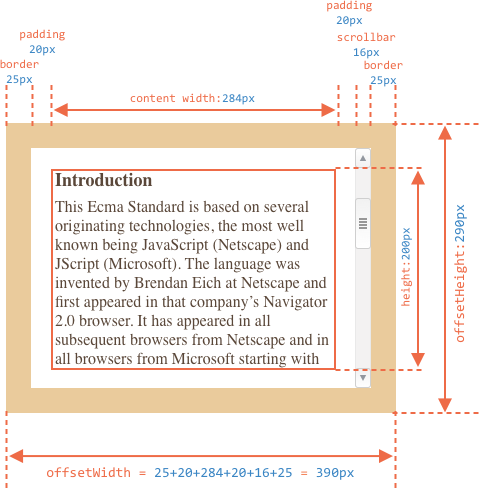 offsetWidth = 390 – the outer width, can be calculated as inner CSS-width (300px) plus paddings (2 * 20px) and borders (2 * 25px). offsetHeight = 290 – the outer height. Geometry properties are calculated only for shown elements. If an element (or any of its ancestors) has display:none or is not in the document, then all geometry properties are zero or null depending on what it is. For example, offsetParent is null, and offsetWidth, offsetHeight are 0. Please note that such isHidden returns true for elements that are on-screen, but have zero sizes (like an empty <div>). Inside the element we have the borders. To measure them, there are properties clientTop and clientLeft. …But to be precise – they are not borders, but relative coordinates of the inner side from the outer side. 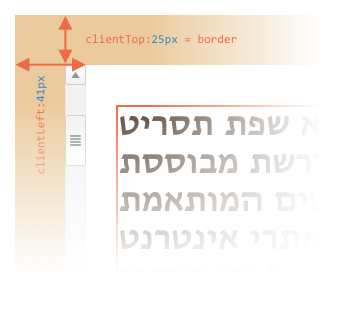 It becomes visible when the document is right-to-left (the operating system is in Arabic or Hebrew languages). The scrollbar is then not on the right, but on the left, and then clientLeft also includes the scrollbar width. These properties provide the size of the area inside the element borders. On the picture above let’s first consider clientHeight: it’s easier to evaluate. There’s no horizontal scrollbar, so it’s exactly the sum of what’s inside the borders: CSS-height 200px plus top and bottom paddings (2 * 20px) total 240px. 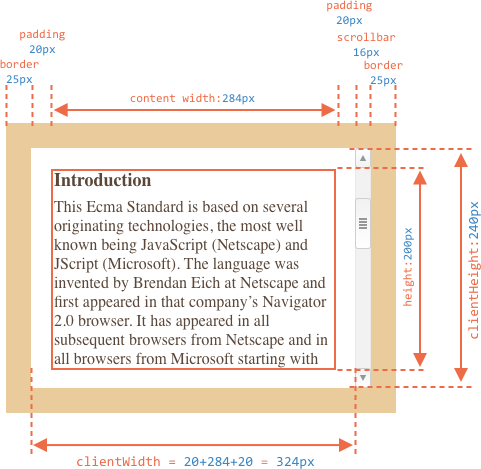 Now clientWidth – here the content width is not 300px, but 284px, because 16px are occupied by the scrollbar. So the sum is 284px plus left and right paddings, total 324px. If there are no paddings, then clientWidth/Height is exactly the content area, inside the borders and the scrollbar (if any). So when there’s no padding we can use clientWidth/clientHeight to get the content area size. Properties clientWidth/clientHeight only account for the visible part of the element. scrollHeight = 723 – is the full inner height of the content area including the scrolled out parts. scrollWidth = 324 – is the full inner width, here we have no horizontal scroll, so it equals clientWidth. We can use these properties to expand the element wide to its full width/height. Properties scrollLeft/scrollTop are the width/height of the hidden, scrolled out part of the element. On the picture below we can see scrollHeight and scrollTop for a block with a vertical scroll. In other words, scrollTop is “how much is scrolled up”. Most of the geometry properties here are read-only, but scrollLeft/scrollTop can be changed, and the browser will scroll the element. If you click the element below, the code elem.scrollTop += 10 executes. That makes the element content scroll 10px down. Setting scrollTop to 0 or Infinity will make the element scroll to the very top/bottom respectively. We’ve just covered geometry properties of DOM elements. They are normally used to get widths, heights and calculate distances. 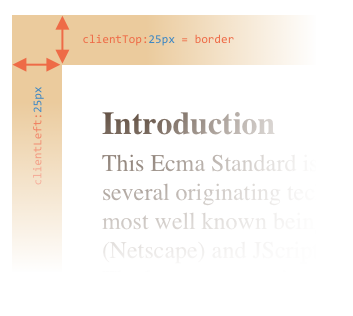 But as we know from the chapter Styles and classes, we can read CSS-height and width using getComputedStyle. So why not to read the width of an element like this? And there’s one more reason: a scrollbar. Sometimes the code that works fine without a scrollbar starts to bug with it, because a scrollbar takes the space from the content in some browsers. So the real width available for the content is less than CSS width. And clientWidth/clientHeight take that into account. …But with getComputedStyle(elem).width the situation is different. Some browsers (e.g. Chrome) return the real inner width, minus the scrollbar, and some of them (e.g. Firefox) – CSS width (ignore the scrollbar). Such cross-browser differences is the reason not to use getComputedStyle, but rather rely on geometry properties. If your browser reserves the space for a scrollbar (most browsers for Windows do), then you can test it below. The element with text has CSS width:300px. On a Desktop Windows OS, Firefox, Chrome, Edge all reserve the space for the scrollbar. But Firefox shows 300px, while Chrome and Edge show less. That’s because Firefox returns the CSS width and other browsers return the “real” width. 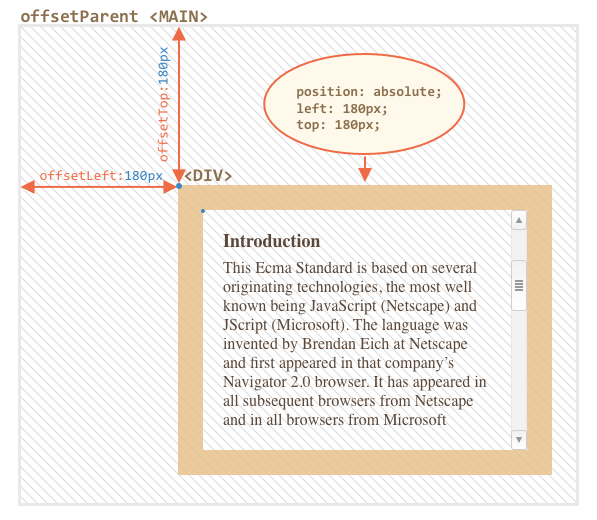 offsetParent – is the nearest positioned ancestor or td, th, table, body. offsetLeft/offsetTop – coordinates relative to the upper-left edge of offsetParent. offsetWidth/offsetHeight – “outer” width/height of an element including borders. 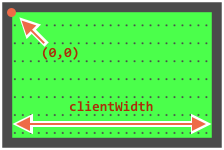 clientLeft/clientTop – the distance from the upper-left outer corner to its upper-left inner corner. For left-to-right OS they are always the widths of left/top borders. For right-to-left OS the vertical scrollbar is on the left so clientLeft includes its width too. 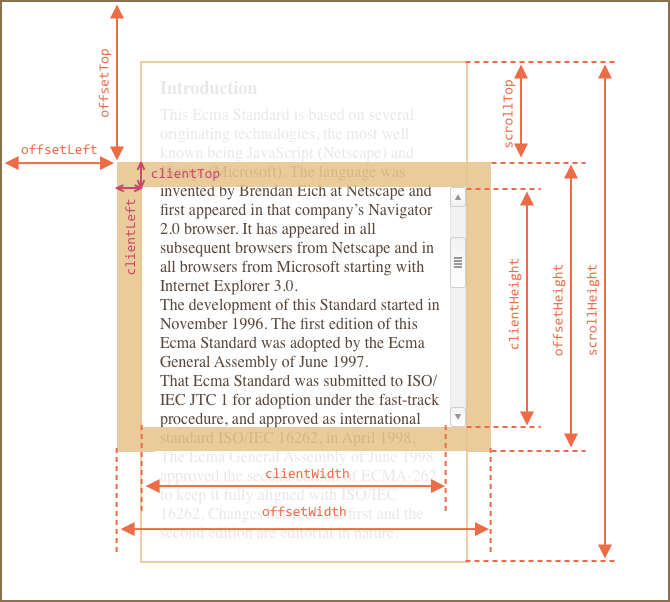 clientWidth/clientHeight – the width/height of the content including paddings, but without the scrollbar. 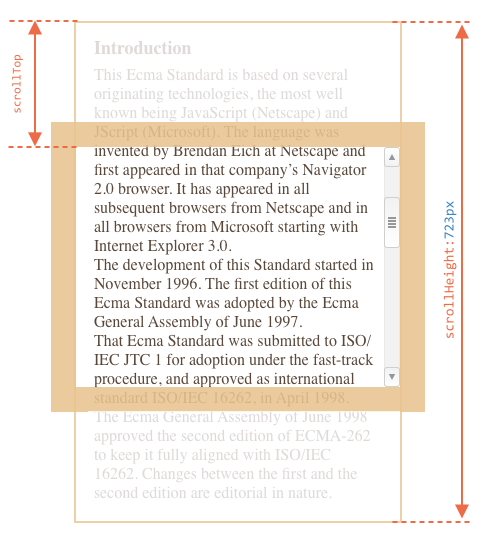 scrollWidth/scrollHeight – the width/height of the content including the scrolled out parts. Also includes paddings, but not the scrollbar. 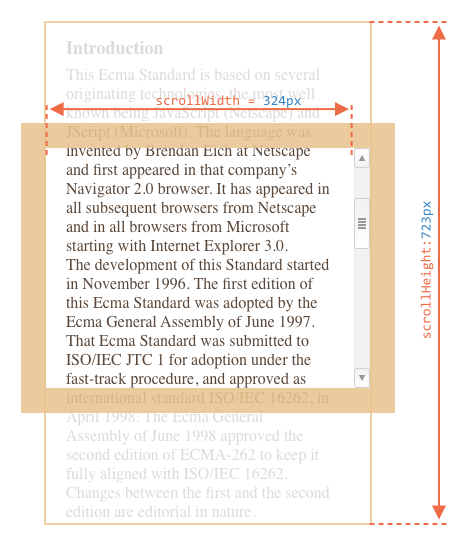 scrollLeft/scrollTop – width/height of the scrolled out part of the element, starting from its upper-left corner. All properties are read-only except scrollLeft/scrollTop. They make the browser scroll the element if changed. What's the scroll from the bottom? The elem.scrollTop property is the size of the scrolled out part from the top. How to get “scrollBottom” – the size from the bottom? Write the code that works for an arbitrary elem. P.S. Please check your code: if there’s no scroll or the element is fully scrolled down, then it should return 0. In other words: (full height) minus (scrolled out top part) minus (visible part) – that’s exactly the scrolled out bottom part. What are coordinates of the field center? The code should work with any ball size (10, 20, 30 pixels) and any field size, not be bound to the given values. The ball has position:absolute. It means that its left/top coordinates are measured from the nearest positioned element, that is #field (because it has position:relative). The inner field width/height is clientWidth/clientHeight. So the field center has coordinates (clientWidth/2, clientHeight/2). When the browser does not know the width/height of an image (from tag attributes or CSS), then it assumes them to equal 0 until the image finishes loading. In real life after the first load browser usually caches the image, and on next loads it will have the size immediately. But on the first load the value of ball.offsetWidth is 0. That leads to wrong coordinates.